More than 8,000 Scientologists gathered in Milan, Italy, Saturday, October 31, to exuberantly mark an historic milestone for the European nation—the largest Ideal Org on the planet—the sleek and modern Church of Scientology of Milan, now transformed to Ideal. Mr. David Miscavige, Chairman of the Board Religious Technology Center—who flew directly to Milan from the United Kingdom after having officiated the opening of the Ideal Saint Hill on October 18 and the 31st anniversary of the International Association of Scientologists (IAS) on October 23—dedicated the new Ideal Organization of Milan. Mr. Miscavige was met with an impassioned reception upon taking the stage, from the thousands of Scientologists and guests on hand to dedicate the new Ideal Church of Scientology Milan. More than 8,000 Italian Scientologists, guests and dignitaries came together to share the unveiling of a Church of singular stature and majesty in the European capital of style and sophistication—the world’s largest Ideal Org. The Church of Scientology Milan was dedicated October 31, 2015, before a spirited audience of some 8,000 who gathered to welcome the Church to its spectacular new home. At the moment the ribbon fell to signify the Church’s official opening, the audience instantly erupted in cheers. It proved to be the most special of days for Scientology in Milan, Italy’s cultural and fashion mecca. Mr. David Miscavige, Chairman of the Board Religious Technology Center and ecclesiastical leader of the Scientology religion, with (left to right): Mr. Fabio Bergomi, of the Executive Council for Volunteerism for the Metropolitan City of Milan; Mr. Gelek Yakar, President of the Mandala Center for the Cultural Preservation of Tibet; Mr. Gianfranco Tucci, Milan City Councilor; Mr. Carlo Proserpio, President of the Council of Trade Associations—North Milan; and Mr. Marcello Arena, Sports Activities Director of the Milan Municipal Police Force. In a serendipitous and colorful moment of perfection, the fates smiled on the dedication of the new Ideal Church of Scientology Milan. The excitement was tangible as guests toured the elegant new facilities of Scientology’s latest Ideal Org. The doors opened wide and the elated crowd surged inside to catch a first up-close glimpse of the magnificent new Church of Scientology of Milan. Every space at the new Church of Scientology of Milan is perfectly configured to provide the highest quality service to parishioners in an environment that speaks to its distinctive Italian style. Scientologists and their guests in Milan toured the city’s new Ideal Org following the ribbon-cutting ceremony, Saturday October 31. The Ideal Church of Scientology is a flawless reflection of the aesthetic of the city in which it resides. Enthusiasm continued to mount as guests toured through the stunning new facilities. Every room is perfectly configured for service to parishioners and the community at large while maximizing the Milan Church’s signature style. Since 1978, the Church of Scientology of Milan has served a growing congregation across Italy’s Lombardy region. It continues that grand tradition of unparalleled service from its new home as an Ideal Organization in Milan’s Bicocca district. The world’s largest Ideal Scientology Organization, the sleek and modern Milan Ideal Church spans 104,000 square feet on 1.5 acres of land surrounding a more than 22,000-square-foot courtyard. Prominent in the extreme, the new Church stands on the city’s Fulvio Testi Avenue and looks out over Milan’s beloved North Park. The entire facility covers a full city block in the fast-emerging district of Bicocca. The Church of Scientology of Milan not only provides the supreme facilities to service Scientologists in their ascent to higher states of spiritual freedom; it is also a home for the entire community and a meeting ground for cooperative efforts to serve people of all faiths. Its doors open to the entire community, the new Ideal Church of Scientology of Milan is fronted by a magnificent 22,000-square-foot courtyard. The entire facility covers 104,000 square feet on 1.5 acres of land. Open seven days a week, morning to night, the Church of Scientology of Milan welcomes anyone wishing to obtain an introduction to Dianetics and Scientology. The Church of Scientology Public Information Center offers some 500 films, providing a complete introduction to every aspect of Dianetics and Scientology. It includes the beliefs and practices of the religion as well as the many humanitarian initiatives and community outreach programs the Church supports. The Public Information Center further presents an introduction to Scientology Founder L. Ron Hubbard through a biographical exhibit honoring his life and legacy. Scientology services and ceremonies are convened in the Chapel, including Sunday services open to members of all denominations. It further serves as an ideal venue for workshops and events in the name of community collaboration for the betterment of Milan. The Café welcomes all visitors touring the Church. The adjoining courtyard serves as a meeting ground in the spirit of an Ideal Organization—a home to both Scientologists and the Milan community alike. The Church of Scientology of Milan also offers a full-service restaurant for parishioners and their guests. The Church of Scientology of Milan Bookstore makes available L. Ron Hubbard’s works on Dianetics and Scientology. In total, Mr. Hubbard’s legacy spans tens of millions of published words in dozens of books and thousands of recorded lectures. Materials are available in 50 languages. The Church of Scientology of Milan provides for the delivery of all Introductory Services. These include evening and weekend Dianetics and Scientology seminars imparting an overview of the fundamental principles and their application in life. Among the many introductory services available at the Church of Scientology of Milan is an entire array of Scientology Life Improvement Courses to help better any aspect of one’s life. Scientology Founder L. Ron Hubbard developed the Purification Program to free individuals from the mental and spiritual damage caused by drugs and toxins as well as exposure to radiation, using a regimen of exercise, sauna and nutrition. The mural in the Purification Center pays tribute to the city of Milan as a design capital of the world. In the Hubbard Guidance Center, Scientologists participate in auditing (spiritual counseling). Beyond this waiting area are rows of auditing rooms for the Church of Scientology Milan’s congregation. Thirty-four auditing rooms provide the ideal, distraction-free environment in which to progress to the state of Clear. The Academy is where Scientologists train to become auditors (spiritual counselors), capable of applying the technology of auditing to help others attain spiritual freedom. The Milan Ideal Org stands as an alpha symbol that perfectly reflects the grandeur of the legendary city—a breathtaking example of style and purpose for Scientology Organizations in Italy and around the world. In yet another historic achievement during a year of unparalleled advances for the Scientology religion, the latest Ideal Organization opened its doors to Milan, Italy, on Saturday, October 31, as an exuberant audience of some 8,000 Italian Scientologists, guests and dignitaries came together to share the unveiling of an Ideal Church of singular stature and majesty in the European capital of style and sophistication. Mr. David Miscavige, Chairman of the Board Religious Technology Center, was met with an impassioned reception upon taking the stage, from the thousands of Scientologists and guests on hand to dedicate the new Ideal Church of Scientology Milan. 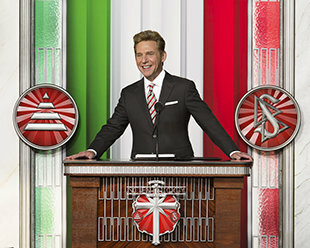 Mr. David Miscavige, Chairman of the Board Religious Technology Center—who flew directly to Milan from the United Kingdom after having officiated the opening of the Ideal Saint Hill on October 18 and the 31st anniversary of the International Association of Scientologists (IAS) on October 23—dedicated the Ideal Organization of Milan. The world’s largest Ideal Scientology Organization, the sleek and modern Milan Ideal Church, spans 104,000 square feet on 1.5 acres of land surrounding a more than 22,000-square-foot courtyard. Prominent in the extreme, the new Church stands on the city’s Fulvio Testi Avenue and looks out over Milan’s beloved North Park. The entire facility covers a full city block in the fast-emerging district of Bicocca. Joining the Scientology parishioners at the milestone event on Saturday were several Italian leaders committed to working with the Church to create a better world. Stepping to the podium to share that passion were Mr. Gianfranco Tucci, Milan City Councilor; Mr. Marcello Arena, Sports Activities Director of the Milan Municipal Police Force; Mr. Carlo Proserpio, President of the Council of Trade Associations—North Milan; Mr. Gelek Yakar, President of the Mandala Center for the Cultural Preservation of Tibet; and Mr. Fabio Bergomi, of the Executive Council for Volunteerism for the Metropolitan City of Milan. The Milan Ideal Org stands as an alpha symbol that perfectly reflects the grandeur of the legendary city—a breathtaking example of style and purpose for Scientology Organizations in Italy and around the world. Elegant and timeless marble, dark millwork and polished stainless steel are accented throughout with red, reminiscent of the area’s famed Ducatis and Ferraris. The facility features a full-service restaurant and café. The Milan Chapel is the largest of any Ideal Org to accommodate Sunday services and weddings, as well as a host of community-wide events open to members of all denominations. Its expansive Public Information Center features displays containing more than 500 films presenting the beliefs and practices of the Scientology religion and the life and legacy of Scientology Founder L. Ron Hubbard. The Information Center also offers a detailed overview of the many Church-sponsored humanitarian programs. These include a worldwide human rights education initiative; a far-reaching drug education, prevention and rehabilitation program; a global network of literacy and learning centers; and the Scientology Volunteer Ministers program, now representing the world’s largest independent relief force. The Ideal Org of Milan further includes multiple seminar rooms and classrooms, in addition to an entire floor dedicated to Scientology auditing (spiritual counseling).